Population of around 332,000 inhabitants. The city is the capital of the province of Alicante, in southeastern Spain. 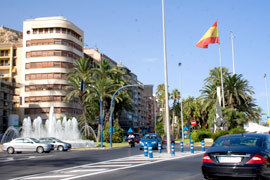 Alicante has its own international airport, just 10 km away from the city centre. Alicante is on Spain's east coast, by the Mediterranean. Alicante is a fantastic mix of urban yet coastal, vibrant yet historical, making it the perfect backdrop for your Spanish studies! As one of the fastest growing cities in Spain, Alicante has plenty to offer. Lying on Spain's southeastern Costa Blanca between the mountains and the sea, Alicante boasts mild temperatures year round, and some of the most beautiful beaches of Europe! With its vibrant nightlife, university atmosphere, gorgeous nature surrounding the city, historical landmarks and all things in between, Alicante has something for everyone! The land of Alicante has been inhabited for over 7,000 years! The mountainous terrain that offered security, and the coastline full of resources ensured its attraction to settlers. The same seaside air you'll enjoy is what attracted first the Romans, and enticed the Moors to stay for more than 500 years, before it was reclaimed by the Christians in the 13th century. Alicante also offers a host of festivals throughout the year; from Saints days and religious holidays, to the Alicante Carnival and the annual Jazz festival, there's always a party here! Alicante also has fantastic transport links. Its airport, just 10km from the city, has connections to all parts of Spain and Europe. The central train station offers daily connections to Madrid, Valencia, Barcelona and Seville, as well as extensive bus services that cover virtually every part of Spain. Alicante's Old Quarter (El Barrio), is a must see for architect fans, as there are many beautiful historic buildings. For those looking forward to Alicante's famous nightlife, La Zona, an area close to the Explanada de España is worth a visit, as is El Puerto district, because that's where you'll find the best shopping, as well as other entertainment and eating venues. San Juan Beach which has become one of Spain's favourite beaches, and easily the most popular in Alicante. It's perfect for swimming, sunbathing or enjoying the seafront's many promenades, like the impressive Rambla Méndex Núñez. Fantastic al fresco dining, bars and shops all await you here. Catedral de San Nicolás de Bari is Alicante's Renaissance Cathedral, with the ornate dome a particular feature worth seeing. A famous 9th-century castle, Castillo de Santa Bárbara is one of the biggest mediaeval fortresses of Spain and has become one of the area's most prominent landmarks, and from its position on the top of Mount Benacantil, offers the most fabulous views of the city. Alicante's oldest church, the Church of Santa Maria, dates back to the 14th Century. This baroque building has a beautifully decorated interior, and is a must-see of the city. 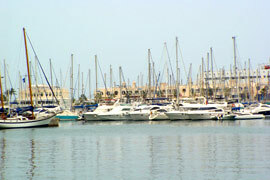 The Marina, which has excellent shopping centres, refined restaurants and nautical adventures to offer. A host of beautiful parks, including Canalejas Park (the oldest park of the city, created in 1886 by the architect Gonzolez Altus) and El Palmeral, which has some amazing waterfalls and hundreds of palm trees. The Island of Tabarca, just off the Alicante coast, with many maritime lines making daily visits, this island is shrouded in pirate history. It also boasts a marine reserve, Baroque style churches and a fantastic culinary scene, making the 11 mile journey well worth the trip! With a blend of heritage and modernism, Alicante has something to offer everyone. The lovely climate it enjoys all year round, coupled with the city's famous beaches, it is easy to see why Alicante has become such a desirable tourist destination, and there is so much culture to enjoy whilst you're here. This intimate city, with its fantastic cuisine and friendly inhabitants, is a great place to learn Spanish!